What's so funny to me about this picture is....it's the third time this has happened this week. 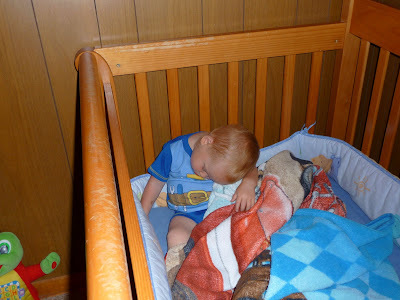 I have posted a couple of other times about Ethan falling asleep in this position. I thought it was just a fluke at first, but this past week, I have discovered otherwise. He actually has his own 'routine' each night. 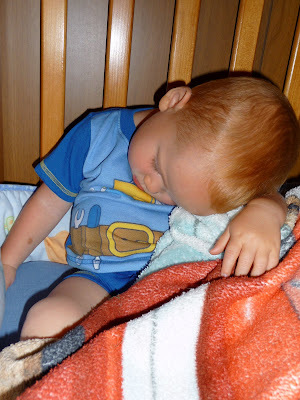 Every night, we do the nighttime duties of brushing teeth, washing hands and faces, going potty, putting on diapers (for the younger two) and turning off the lights. The boys' room is still pretty bright due to the cute little CARS pretend 'stoplight' that sits on the dresser. I know, I know....this aids my sons in the whole not-wanting-to-go-to-sleep thing, but for now, the night light stays--the boys do not like it one bit when their room is completely dark! 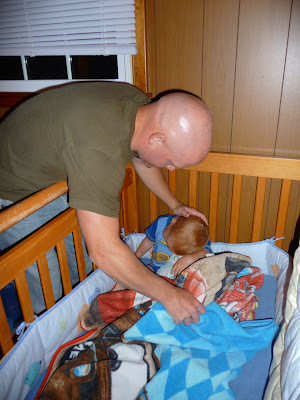 Then, it's one of us (usually Daddy--I'm always the one behind the camera) to the rescue to put him in proper sleeping position for the night. I love the cute little things that the boys do that makes them unique...this one definitely ranks at the top of my list for Ethan! That is so cute (and sweet)!! And I love the little tool belt on his pjs! What a sweetie pie! The positions little kids can sleep in just make my neck ACHE! 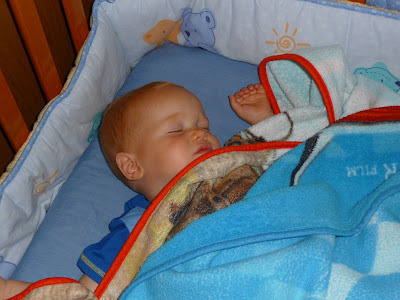 i love those precious sleeping cheeks--too cute!